Integrity Sampling’s Melbourne branch offers a total range of drug and alcohol management services, including drug testing and alcohol testing. In addition, we provide services in drug and alcohol education, and drug and alcohol policy and procedure development. As a Melbourne client, you have the reassurance of knowing Integrity Sampling is accredited by NATA, the authority that provides independent assurance of technical competence. We are also ISO Quality Management certified. In addition, Integrity Sampling uses NATA accredited, independent laboratories to confirm all positive results from our drug testing and alcohol testing. This provides clients with the assurance they need to take action against employees found to be working under the influence of drugs or alcohol. Add in our 24/7 emergency call out for drug and alcohol testing plus our experience, and it’s easy to see why Integrity Sampling is Melbourne’s first choice for drug and alcohol management services. 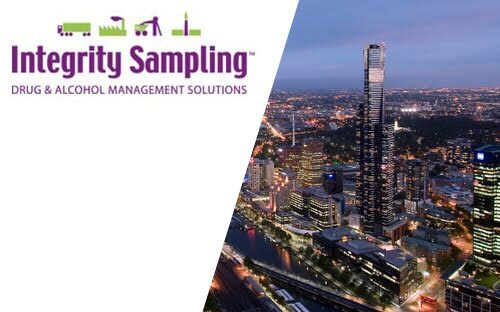 To find out more about Integrity Sampling and the services we provide in the Melbourne area, phone 1300 SALIVA or go to our contact page and submit a form.